In this paper we address three research issues. 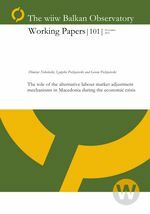 First, we are interested in assessing the impact of the recent economic recession on the general labour market performance in Macedonia. Second, we consider the question of how the economic crisis has affected different labour market segments. Finally, we intend to explore the role of the non-traditional labour market adjustment mechanisms such as employment in the informal sector, non-participation and emigration from the perspective of their capacities to absorb a part of the unemployed workforce.